The Munsell Books of Color are color swatch books that help you select and communicate color. The color index books are based on Munsell’s visual color order system, so it’s faster and easier for you to select the colors you need. Plus, the colors are organized like the popular color wheel making it easier to navigate each Munsell Book of Color. Each Munsell Book of Color is made to exacting triple A rated Munsell standard tolerances that are unmatched in the industry, so there’s no visible difference of the same color swatches between books. That means you have an accurate, reliable color standard to communicate to your colleagues, supply chain and clients. And anywhere in the world Munsell Books of Color are used, rest assured the color is consistent. Available in a variety of finishes, these color collections serve a wide range of applications including art and design, package/product design, color specification and color quality control. 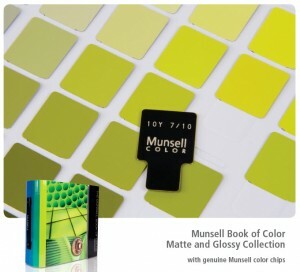 The Munsell color swatch books are to the designer or color specifier what a dictionary or thesaurus is to a writer. Munsell color swatch books are staples in the reference library of designers or color specifiers working in any industry. A color index book of vibrant to neutral colors and in glossy or matte finishes, Munsell Books of Color represent a wide array of thousands of color swatches. You can depend on Munsell Books of Color for accurate color collaboration between design teams, vendors and any supply chain partner on color palette development, conducting color comparisons and establishing standard color swatches for color quality control in the production environment. Organized for the way you see color; designed for the way color is manufactured, the Munsell Book of Color is an atlas and compass combined. Any color swatch you can imagine can be located in color space along with its neighboring colors. So the more you frequent a given color “neighborhood,” just like an atlas, you become more familiar with the colors in a given space. And when you arrive in a new neighborhood, you quickly and easily become acclimated. More importantly, you have a useful tool that will help you predict how color will change should you take a new color direction and also help you visualize how the new color will look. The right color standard makes communicating with color faster, easier and more cost effective. Can’t find the right color communication standard? Contact us about developing a custom color swatch for your application.